Spot is a cheeky little dog, always into something and learning new tricks. He would really like to be a movie stunt dog when he grows up. 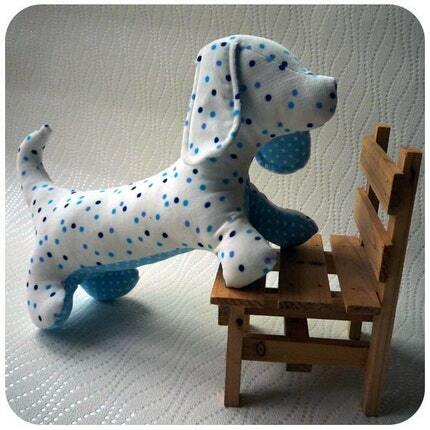 He is is approx 32cm / 12.5" from nose to tail and 17cm/ 7" tall perfect playmate size. He has no button or other small objects so you are safe letting him play around babies and toddlers. His coat is a lovely velvety Japanese fabric, so soft to stroke and his belly is a polka dot cotton. He is stuffed with polyfil and love. Folksy :: Buy "Dave Sock Dog"
Folksy :: Buy "Colin Sock Dog"